Intex Aqua Qwerty has been officially launched at Price of RS 5000. The new Intex Aqua-Qwerty comes with some nice specifications when it goes from a true review. It has 3.5 inch 480 x 320 pixels capacitive touch screen display and gains the power from 1.2 GHz dual core CPU. 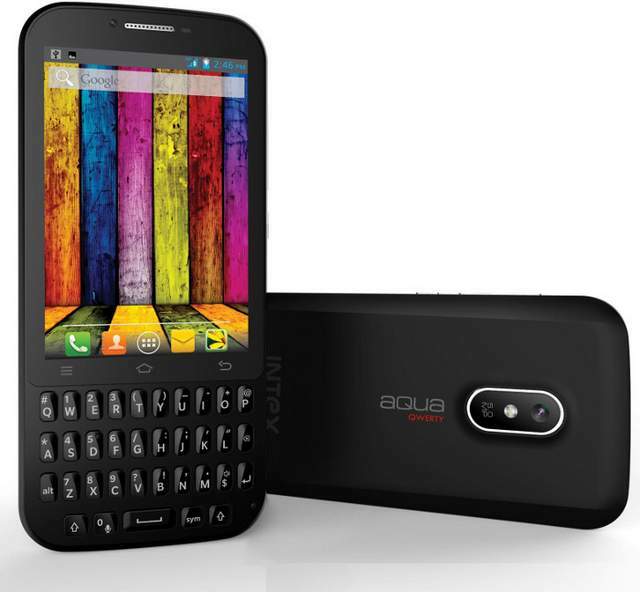 The Aqua Qwerty packs with a 5 MP primary shooter and accomplished with a VGA front camera. It has 512MB of RAM and 4 gigs of internal storage + up to 32 gigs of Expandable storage. It has DUAL SIM support and features 3G, WiFi, Bluetooth and GPS. It houses 1500 mAh battery to power the handset. To make the device run there is Android 4.2 Jelly bean OS. It would compete with other handset at this price tag. In 2012 Micromax launched there first qwerty smartphone.